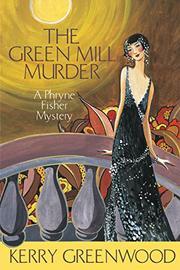 Elegant Phryne Fisher visits the Green Mill jazz club with a foppish acquaintance and is once again a witness to murder. The gentleman half of one of the last two couples still standing in a 1920s Australian dance marathon falls dead at the feet of Phryne Fisher (Death at Victoria Dock, 2006, etc.) and her partner Charles Freeman. As Phryne’s old pal Police Inspector Jack Robinson arrives to investigate, squeamish Charles goes off to the gents and quietly disappears from the club. Phryne, chatting with the attractive bandleader Tintagel Stone, barely notices his absence. When Charlie remains missing, Phryne is hired by his hysterical and unpleasant mother to find him and his brother Vic, who was shell-shocked during the war and has retreated to an unknown mountain hideaway. Phryne enjoys a dalliance with Tintagel, helps the marathon winners claim their prize, gets Charlie to turn himself in and discovers the murderer, but decides not to mention it to Jack until she returns from a dangerous plane trip to track down Vic. She encounters many a delightful character, including a potato-loving wombat, enjoys a brief fling with Vic and returns to Melbourne a satisfied woman. Despite the joys of traveling Australia with the delightful Phryne, readers may be somewhat less satisfied by this messy mystery.